Halloween is almost here, and we love this time of year — including the bright colors, festive costumes, and, yes, the sweet treats that come along with it. But as much as we love a good spider cookie or orange-frosted cupcake, we also know that an overabundance of candy and sweet treats can be a real nightmare for kids’ smiles. 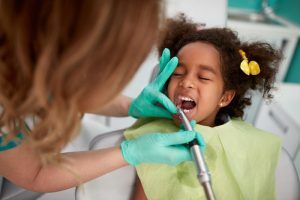 Your dentist in Temple wants to help all kids enjoy a happy, healthy, and safe holiday — and that requires a little help on your end. Keep reading for our top 5 tips for a responsible halloween! While you are stocking up on sweet treats to keep around the house or pass out to trick-or-treaters on halloween night, take a little time to make sure you’re choosing items that won’t be hard on their smiles. Hard, sticky candy — like Jolly Ranchers, Bit O’Honey, suckers, push pops, and others — are more likely to get lodged in the teeth and accelerate the rate of decay. Nutty candy can also spell trouble for kids with braces. But no one’s suggesting you forgo candy altogether. Instead, choose soft items that dissolve more quickly and aren’t tough to bite down on, like chocolate bars or soft peppermint candies. Halloween is an excellent time to talk to your child about the importance of moderation. Communicate that it’s fine to enjoy a little bit of candy, but that gorging on their halloween haul is bad for the body. To help your child regulate their candy consumption, try dividing the candy up into smaller portion sizes. On halloween night, help them sort the candy into plastic baggies (with two to three pieces per bag). Set a limit you feel comfortable with — maybe they can have one bag every day, every other day, or every week. If you send your child off to trick-or-treat on an empty stomach, you’re greatly increasing the chances that they will overindulge on halloween night. Plan to sit down and eat a balanced, nutritious, and full meal before they go out for candy. It’s also a good time to talk about the importance of healthy eating. Once your child comes back with a bucket full of treats, you’ll probably have a hard time getting them to willingly surrender any of it. To help, you can set up a candy buy back with “goods” you’re offering — like maybe they can get a small toy or movie ticket in exchange for 10 pieces of candy. Halloween season is a perfect time to visit the dentist for a checkup and cleaning! We’ll remove all plaque and tartar that’s had the chance to build up since they last came in, take x-rays to check for cavities, and also apply dental sealants and fluoride if needed. Doing so will help them enter the holiday season with a healthy, beautiful smile! Dr. Richard Fossum and Dr. Brooke Elmore are trusted sources of family dentistry in Temple, TX. To learn more about their comprehensive services or to schedule an appointment for you or your child this October, please do not hesitate to get in touch with the office at 254-778-3900.